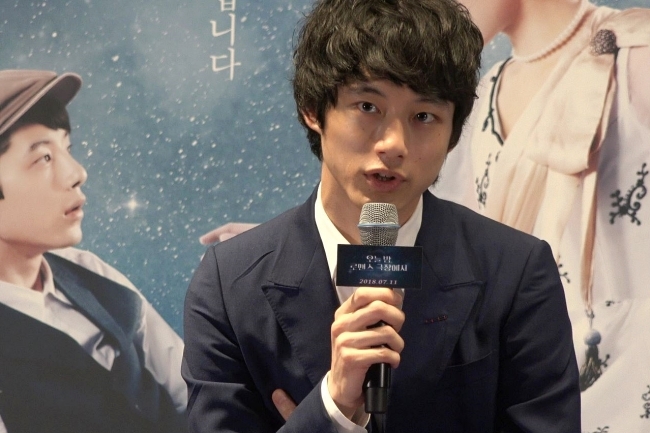 Japanese movie star Kentaro Sakaguchi visited South Korea and talked about his upcoming movie “Color Me True” at a press conference Tuesday. The 26-year-old actor, who has been garnering massive popularity among J-pop fans in Korea, arrived in Seoul on Monday to promote the film, which will be released on July 11. News on his visit soon plastered social media platforms, while movie tickets that include fan meetup events were sold out in a minute. The fantasy-romance movie “Color Me True” depicts the story of a wannabe director, Kenji, who falls in love with a movie character princess, Miyuki, from his favorite black-and-white film. Sakaguchi and Japanese actress Haruka Ayase play the lead roles of Kenji and Miyuki respectively. “Kenji is a bit pitiful and (a) weak character, but his love toward the Princess Miyuki is genuinely pure,” Sakaguchi said during the press conference. Sakaguchi recalled that he always kept an eye on Ayase at the filming location, as he wanted to increase the realistic elements of the movie. When asked about a favorite character that he would like to fall in love with, the actor mentioned an animation character. “I used to like the animation character Nausicaa from ‘Nausicaa of the Valley of the Wind’ when I was little. I think it would be fun if I can talk with the character,” Sakaguchi said. During the press conference, he talked about his favorite Korean food and answered a few questions about his visit to Korea. “I arrived in Korea about 6 p.m. yesterday, and I went straight to a Korean barbecue place,” the actor said, adding that he especially enjoyed rice and somaek, a mix of beer and soju. 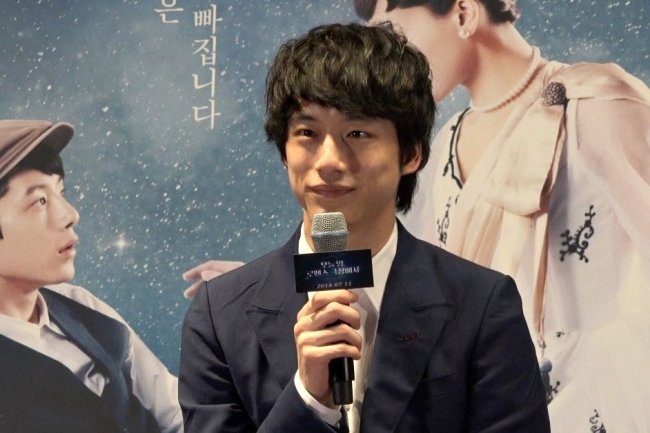 In response to a question about a Korean actor he would like to work with, Sakaguchi said K-pop star Seo Kang-joon, who is said to look like him. Sakaguchi also revealed his excitement ahead of meeting fans in person.